Singapore, offen referred to as the green lung of Asia, and the city of the lions! Yep, lions … No worries, we haven’t seen a single one, except for the one at Merlion Park and at Sentosa Island … Giant statues :)) You’ll find Merlion Park in Marina Bay. The Merlion is the mascot of Singapore, the creature has the body of a fish and the head of a Lion. There is another Merlion on Sentosa Island, which is basically a giant theme park. It is also the southern most point of continental Asia. Be sure to go to the Padang area, with the parliament houses (old and new), churches and the Raffles Hotel. The riverside quays are excellent to have a nice cooling-down walk. Marina Bay is very modern with high-tech buildings (malls included) and if the lights of those buildings weren’t enough, the Bay transforms to a light and music event place at night. Both at the Bay and at the Gardens there are beautiful light-and-sound shows. With the Infinity Pool on top of it, the one building you cannot miss is the Marina Bay Sands Hotel. We were lucky to stay there for one night and experience a little bit of luxury. The view from the pool is amazing! If you don’t stay in the hotel you can’t have access to the pool, the only possibility then is the observatory deck. If you’re in for ‘giants’, be sure to have a look at the giant trees at Gardens by the Bay. Giant trees meaning giant structures that will become look-a-likes of trees one day, but it is beautifully done! These Gardens are the new Botanic Gardens, and can be found at Marina Bay. Spacious, modern, well designed, perfect for a nice walk! The ‘old’ Botanic Garden is at the end of the famous shopping street Orchard Road (think Gucci, Louis Vitton, D&G, Prada, … You can really find it all here, but also Asian food hawkers and malls, malls and more malls) – it is a classical garden, with all the tropical plants you can find in this part of the world. The Orchid Garden is world famous, with more than 200 species of orchids! Be aware of the monkeys though. Above all, Singapore is multicultural! 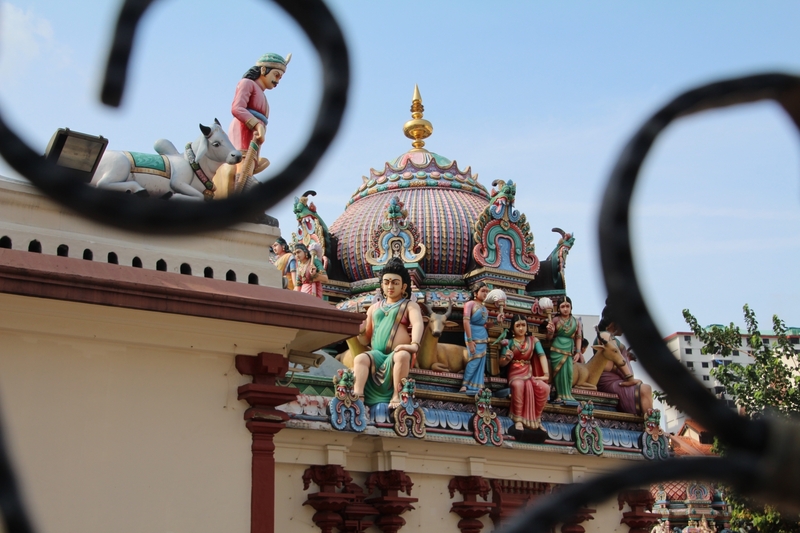 Mosques, hindu temples, Chinese temples, the Buddha Tooth Relic Temple, churches, you name it and you’ll probably find it here … Not so long ago there were tensions around the Indian quarter (Little India), but we didn’t notice anything awkward. Since we stayed in that area, we’ve seen a lot of hindu temples, from which unfortunately we don’t remember their names. But anyway, most of them are beautiful, and if you take of your shoes, you’re more than welcome to go inside and have a look at the statues of Vishnu, Kali, Lakshmi and the other gods and goddesses. The Buddha Tooth Relic Temple in Chinatown was only opened in 2008. It is said they have the real left canine tooth of Buddha. Even if you cannot find that tooth, the building is impressive! Chinatown itself is a nice area to have a walk around and visit some more temples. The Sultan Mosque in Kampong Glam is one of the most important mosques in Singapore and was built around 1825. About 100 years later, the mosque had become too small, and the current building was erected. You can go inside, which we didn’t do. There are several churches as well, although there isn’t really a ‘catholic’ district. The churches pop up between the other buildings, so keep an eye on them. When you plan a stop-over, you should really consider Singapore. Not only the city itself is well worth the visit, there are nice day trips you can make, and off course the airport is an attraction in itself. At Changi Airport even the most jetlagged tourist will come back alive! Besides the obvious shopping, you can have your feet massaged by fish, have a walk in the gardens or have a swim. Check out the website of the airport before you take off, if you have a few hours to spend here, you’ll definitely won’t get bored. Singapore Lightshow from Travel for Motion on Vimeo.